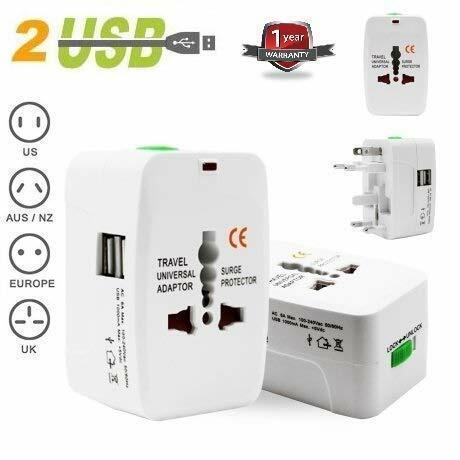 eErlik Universal Adapter Worldwide Travel Adapter with Built in Dual USB Charger Ports (BLACK) Dual USB Ports DC5V 2.1A 10W, Work with iPad, iPhone, Galaxy Phones and Laptop Cameras, Indoor Use Only. Input: 110-275W / Output: 110-275W 6A MAX /max 220W: 550WTear Off the Plastic Film From Surface Before Use. This Charger Adapter Plug Converts the Power Outlet Only, It Does Not Convert Electrical Output Current and Voltage. Accepts Plugs From More 150 Countries with USA/EU/UK/AU/CHINA/JAPAN Plugs,Equipped with Built-in Safety Shutters,Include 1x Universal Adapter / 1x Fiber Bag / 1x Instruction in English and Chinese. FEATURES: Suitable for equipment with ungrounding plugs (2 pole) . Power Rating 6A max. 100-240Vac (660W max. at 110Vac. 1380W max. at 230Vac). Get connected in over 150 countries worldwide. Light weight, easy to carry, a user friendly accessory is a perfect one-size-fits-all solution for people of high international mobility. Warranty from eErlik : Backed by eErlik 1 YEAR Limited Warranty and Lifetime Friendly Support.